Two men charged in connection with a foiled plot to bring down an airplane were also accused by Australian police of trying to build a device that could unleash poisonous gas in a public space. 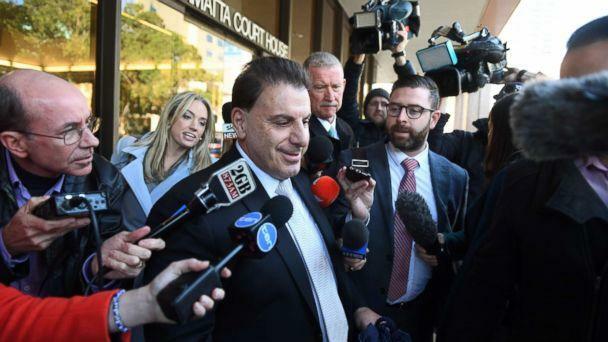 The two suspects, Khaled Khayat and Mahmoud Khayat, were charged Thursday night and appeared Friday morning in Parramatta Local Court in Sydney via video link from their jail cells, where they have been remanded in custody as they await a trial date. Each faces two counts of acts done in preparation for, or in planning, a terrorist act, and the charges carry a maximum penalty of life in prison. No plea was entered Friday. Australian police have not detailed whether the men are related. Michael Coroneos, the attorney for the two suspects, declined to answer questions outside court Friday, telling reporters, "They're entitled to the presumption of innocence." The would-be attackers were among four men arrested in Sydney on Saturday over allegations of a potential terrorist attack. One man was released from police custody without charge Tuesday. Another remained in custody without charge Friday under the country's "specified time" provisions, which allow for extended detention of suspects in terrorism investigations, according to the Australian Federal Police. Both Khaled Khayat and Mahmoud Khayat were allegedly linked to the twin terror schemes and allegedly received instructions from ISIS in Syria. Australian Federal Police told reporters Friday that authorities are confident they completely disrupted both plots, which the deputy commissioner for national security, Michael Phelan, described as "the most sophisticated" ever planned on Australian soil. Khaled Khayat and Mahmoud Khayat allegedly planned to place an improvised explosive device (IED) aboard an Etihad Airways flight in Sydney on July 15, but "at no stage did the IED breach airline security," Phelan said during a news conference Friday. Australian police allege the components of the device were sent by ISIS operatives through international air cargo from Turkey to the accused men in Sydney for assembly. According to authorities, a senior member of ISIS, who was in touch electronically from overseas with the two men, assisted in their assembling the components into what investigators believe was a functioning IED using military-grade explosives intended to be taken to Sydney Airport and placed on the plane. According to the U.S. State Department, the device was likely designed to be hidden inside a "meat grinder." At the press conference Friday, Australian police stressed that the device never made it through airport security and was denied access at the earliest stages. One of the accused men allegedly attempted to plant the IED on his brother, who was unaware of his role in the planned attack as a "mule" to carry the device on board the flight, Phelan said. The brother is now abroad and Australian police have no plans to arrest him. Another brother of one of the two men is allegedly a known ISIS senior commander in Syria. Phelan said this brother connected ISIS operatives with the two accused men, who began communicating in April.